"There were 100,000 of us Joe. We're not dead. We just made some choices you don't approve of." — Zhang Lin talking about the Tiananmen Square protest. Lucy Kirkwood's Chimerica, which she has been writing for six years, has been developed with Rupert Goold&apos;s Headlong for the past three years and the result is a spectacular piece of theatre set in Manhattan and Beijing. The finished work has resonances for me of Headlong&apos;s Enron but also struck me like some of the Poliakoff pieces based on archive photography, for instance, for television, Shooting the Past. The word Chimerica, coined by economist Niall Ferguson, is a combination of China and America, which the Urban Dictionary tells us is the idea that China and America are concurrently leading the world in terms of a financial symbiotic relationship. Through a fictional photographer's journey, 24 years after the Tiananmen Square squashing of the student demonstration on 4th June 1989, we look at modern day China. Kirkwood&apos;s character, Joe Scofield (Stephen Campbell Moore) took one of the iconic photographs of the unknown man standing in front of the line of military tanks, whose image went round the world and who was dubbed “Tankman”. This unknown man was named by Time Magazine as one of the most influential men of the 20th century. Joe's mission is to find out what happened to this brave man and this journey will take him to China and New York. Joe flies out to Beijing with journalist Mel (Sean Gilder) and business entrepreneur and marketing expert Tessa (Claudie Blakley), and in China makes contact with his old friend, an English teacher Zhang Lin (Benedict Wong). Lin is haunted by images of his girlfriend Jennifer (Elizabeth Chan) from their student days in the 1980s and through him we meet his brother Zhang Wei (David K.S.Tse), whose son Benny (Andrew Leung) is studying at an American university. As in a detective story, Joe will follow up leads towards finding the “Tankman” and in the process, discover much about modern China. Packed into just over three hours, we will learn about the rapid industrialisation in China, about pollution and dissenters, torture and repression through the people Lin and Joe meet. The action will switch between Beijing and New York as we follow leads about the man who stopped the tanks. Director Lyndsey Turner's production is excitingly staged with black and white photographic projections onto a revolving box, which change continuously and by over 40 different scenes, created within the tall cuboid. As the sets rotates, there is music to punctuate the scene changes. Some of the photographs will be highlighted in red with arrows as if selected by the photographer from contact sheets. As two people meet in a Chinese restaurant in New York, we will see fleetingly through one of the rooms, behind a gauze screen, the Chinese cooks frenetically at work with steaming woks, tossing stir fried meals. This staging tells you what effort happens for that Chinese meal you will be eating and the conditions for the immigrant kitchen workers, as well as leaving you reflecting on an unforgettable dramatic image. 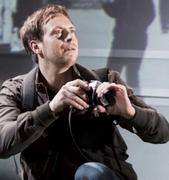 Stephen Campbell Moore's character is attractive and has a sympathetic, quiet, often troubled air. Sean Gilder, his brash alcoholic friend Mel, has many of the play's witty lines. Benedict Wong is touching as Lin, the man who keeps seeing Jennifer in confined spaces in his small flat. She pops up in cupboards and emerges from the fridge, like she pops up in his memory. We are horrified by Lin's interrogation by the police in China and compelled by his compassion for the woman who died of a pollution related illness. Claudie Blakley as Tessa has an interesting journey with a loss of confidence. Actors playing support roles make the cast appear to number much more than a dozen. There are more questions than answers in Lucy Kirkwood's enthralling play, which is just as it should be, and plenty to make me want to see it again. There is a surprise which no-one saw coming. If this co-production is a taster of what we can expect from Rupert Goold&apos;s artistic directorship at the Almeida, then I can't wait!